As a Mail Administrator You Need to Understand How to Successfully Monitor and Fight Spam. Milters are among the most powerful antispamming tools available. Until now, there has been no clear and helpful resource for you to learn how to set up and use Milters. 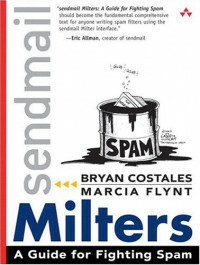 sendmail Milters: A Guide for Fighting Spam is the first in-depth guide to writing powerful Milters to block even the most clever spammers. This book is an indispensable aid to combating spam, now and in the future. If you administer a sendmail server, you need to own a copy. Sams Teach Yourself Gmail in 10 Minutes gives you straightforward, practical answers when you need fast results. By working through its 10-minute lessons, you’ll learn how to take complete control over your email–and communicate with anyone, anywhere–quickly and easily!